Fuel Property Estimation and Combustion Process Characterization is a thorough tool book, which provides readers with the most up-to-date, valuable methodologies to efficiently and cost-effectively attain useful properties of all types of fuels and achieve combustion process characterizations for more efficient design and better operation. Through extensive experience in fuels and combustion, Kiang has developed equations and methodologies that can readily obtain reasonable properties for all types of fuels (including wastes and biomass), which enable him to provide guidance for designers and operators in the combustion field, in order to ensure the design, operation, and diagnostics of all types of combustion systems are of the highest quality and run at optimum efficiency. 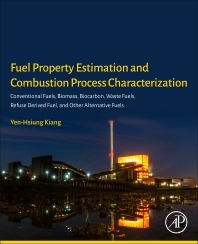 Written for professionals and researchers in the renewable energy, combustion, chemical, and mechanical engineering fields, the information in this book will equip readers with detailed guidance on how to reliably obtain properties of fuels quickly for the design, operation and diagnostics of combustion systems to achieve highly efficient combustion processes. Yen-Hsiung Kiang has over 40 years experiences in fuels, incineration, combustion, solid waste, sewage sludge drying, composting, groundwater pollution, soil contamination, cogeneration and liquefied natural gas, wastewater treatment, air pollution, and other aspects. He received his ME and PhD in Chemical Engineering from the University of Florida, and is a registered professional engineer in Pennsylvania, USA. Dr. Kiang is currently the Chief Technology Officer of XIAMEN BAIPENG ENVIRONMENTAL ENGINEERING CO., LTD., member of the boards of directors of Falcon Power Co., Ltd. and China Alternative Energy Association, consultant to the Energy and Carbon Reduction Office of Executive Yuan, ROC and lead consultant of Sustainable Development Green Energy Resources, Ltd. Throughout his career, he has executed planning and design of hundreds of waste treatment centers (including incineration, cogeneration, physicochemical treatment, solidification and land fill). He participated in the planning, design and operation of hundreds of incineration systems, Including solid waste, liquid waste, waste water and sludge, with fixed bed incinerators, mechanical bed incinerators, rotary kiln incinerators, fluidized bed incinerators, and liquid injection incinerators. Dr. Kiang has also executed numerous license applications for incineration and air pollution systems, and incineration systems trial burns, as well as a pilot facility for combustion testing and incineration. In the energy sector, in addition to power plants and cogeneration, he has participated in the design and planning of gas liquefaction and gasification systems, sludge anaerobic digestion system design, planning of biogas and compost recycling system, plasma melting furnace, synthetic gas resource recovery facility planning and construction, and diesel engines power plant construction projects. Chief Technology Officer, Xiamen Baipeng Environmental Engineering Co., Ltd.